Swineside Knott and Common Fell are the two highest points on Watermillock Common which is a ridge of high land that rises 400 metres above Ullswater and is the end part of one of the long eastern ridges of Stybarrow Dodd. Swineside Knott being the highest by 1 metre at 553 metres (1814 feet) is only a rounded grassy mound with some protruding rocks but provides the most wonderful extensive views of Ullswater from the head of the lake at Patterdale to its foot at Pooley Bridge. Common Fell is a number of grassy mounds with a small cairn on the highest one and a glacial erratic boulder sits on one of the other mounds. Common Fell being more centrally place on the ridge gives the feeling of being Watermillock Common’s natural summit rather than Swineside Knott and provides wonderful views to the north and east. The majority of Watermillock Common is Open Access land. Dockray is a very small village in Patterdale in the Lake District of Cumbria. Just near the bridge over Aira Beck there is the village inn, The Royal Hotel, which sells real ales and has accommodation. Dockray is only just over a mile from Ullswater one of England’s most beautiful lakes and is also England’s second largest lake. At approx 9 miles long and three quarters of a mile wide the lake is a typical narrow ‘ribbon lake’ formed after the last ice age by three separate glaciers. 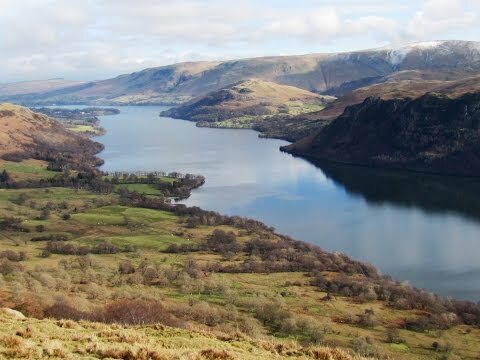 The surrounding fells give Ullswater its stretched Z shape with three distinct reaches and the lake now form’s most of the boundary between Cumberland and Westmorland. Pooley Bridge an attractive village popular with tourists lies at the very northern end of the lake, whilst Patterdale lies at the very southern end. Ullswater is the setting for William Wordsworth’s famous ‘Daffodils’ poem after he saw daffodils growing on its shores. Whatever the weather or the season Ullswater is a wonderful place with so much to offer whether breathtaking views or outdoor activities. Ullswater is very popular with sailing, yachting, rowing, motorboats and diving and marinas can be found around the lake edge. The Ullswater Steamers, although now powered by diesel, are a great way to see the lake. The steamers were originally working boats in the 1850’s moving mail, workers and goods to and from the Greenside lead mine at Glenridding which closed in 1962. They operate trips all year round calling at Pooley Bridge, Glenridding, Howtown and Aira Force. The popular tourist villages of Glenridding and Patterdale are only about 3miles further down the road. Aira Beck flowing from the rolling fells of the Dodds passes through Dockray then turns south to find its way into Ullswater. The final stretch of Aira Beck drops over 200 feet over two waterfalls, High Force and Aira Force the latter having a bridge over the top and bottom of the fall making it one of the most popular and photographic waterfalls in the Lake District. Owned by the National Trust Aira Force has an impressive drop of 66 feet down a rocky ravine and after heavy rain it is even more impressive. In wet weather the paths can become very slippery so please take care. From the car park we cross over the road and take the stile opposite then head forward following the path uphill. When the path splits we bear right, crossing many becks as we head slightly uphill through the trees to meet a wall. We go through and head forward more steeply uphill through thicker woodland. We eventually come to wall on the open fell we go through, turn right and follow the path a few feet above the wall but running parallel. At the brow and where the ground starts to drop down next to a tree just on the other side of the wall we bear left off the path steeply uphill over rough ground heading for a small knobble of high ground, Swineside Knott. At the top we head towards two stones one on top of the other and then head forwards to a small rocky outcrop with a small cairn. We now turn right and follow the clear quad bike tracks which weaves as it crosses some boggy ground and bears left towards the next highest point Common Fell. On the approach to Common Fell we bear left at the fork to reach the summit marked by a small cairn. We head to a large solitary boulder then bear slightly right downhill towards the wall to pick up the quad bike tracks again and bear left. When we reach a beck we cross over and turn left towards Dockray we can see in the distance. As we near the village we turn right towards a small stone building. We pass to the right of this to go through a gate and head forwards to the telephone box. We now turn left onto the road and immediately after crossing the bridge we turn sharp right along a track signposted Aira Force and Ulcat Row. The track bears left between two buildings signposted Aira Force. We cross over a bridge and bear right over a stream then go through a gate. We head forwards following the track we can see Common Fell on our right, into some woodland. At the first bridge we cross over it and turn left then left again at the signpost Aira Force. We now just follow the path keeping Aira Beck on our left. We pass an old stone bridge over Aira Force and bear right up the steps. At some steps going down and a bench we head forwards for a short way then turn right uphill back to the car park. This is a moderate to hard walk on grass and stone paths and tracks. There is also a short distance on tarmac road. Approx 4.75 miles allow 2½ – 3 hours using OS Explorer Map OL5, The English Lakes North-eastern area. This walk is clockwise. Start point: Park Brow, pay and display car park above Aira Force. This is the second small car park after the hamlet of Dockray. Fee is £6.50 for all day. Dockray lies on the A5091 about 1 mile above Aira Force and the shore of Ullswater in the Lake District, Cumbria. From the A66 at Troutbeck take the A5091 sign posted Ullswater. After approx 3.5 miles pass through Dockray and continue a little further to reach the second car park on the left, Park Brow. Parking: There are two small pay and display car parks at the side of the road (A5091) between Dockray and Aira Force and a large pay and display car park at Aira Force. There is no public toilets on-route, but there are some in the pay and display car park at Aira Force. The next nearest ones are at the Glenridding. For refreshments there is The Royal Hotel at Dockray and there are pubs and shops at Glenridding and Patterdale.